Here you are going to find out everything there is to know about the mirror hour 20:20. We often see double hours in our lives and these can leave us with a bizarre feeling! This is completely normal. It is due to a synchronicity which has been spotted by our subconscious which is an area of our mind that acts as a channel of communication. Even if we are unable to control our subconscious, it is still possible to analyze the messages it gives us. To give you the most complete interpretation possible we are going to make use of a study of the angels via the works of Doreen Virtue, as well as a calculation of the hour's numerological value and its connection with the Tarot. You will then have an overall view of what 20:20 means. This will allow you to better understand why you have seen this mirror hour and how you should interpret this sign. When we come across a mirror hour such as 20:20 we often want to find out what it means right away. Here you will be given access to all the information you need to better analyze the symbolism and the hidden meaning behind this hour. It is just like drawing a card from a Tarot deck, it means you have been given a message! An interpretation of 20:20 using the works of Doreen Virtue allows us to give you a more complete meaning of this mirror hour. Your angel is telling you that you shouldn’t be doing everything in a rush. You prefer things to go by quickly, but you should also take the time to finish what you’ve started for the sake of your credibility. You have a great sense of curiosity which allows you to study and speak about many different subjects, but be careful not to enforce your point of view on everyone. If you do, you will risk stifling the people close to you! Do not hesitate to ask your guardian angel to fill you with wisdom and humility. You should concentrate on the path of the spirit, and not the path of materialism! 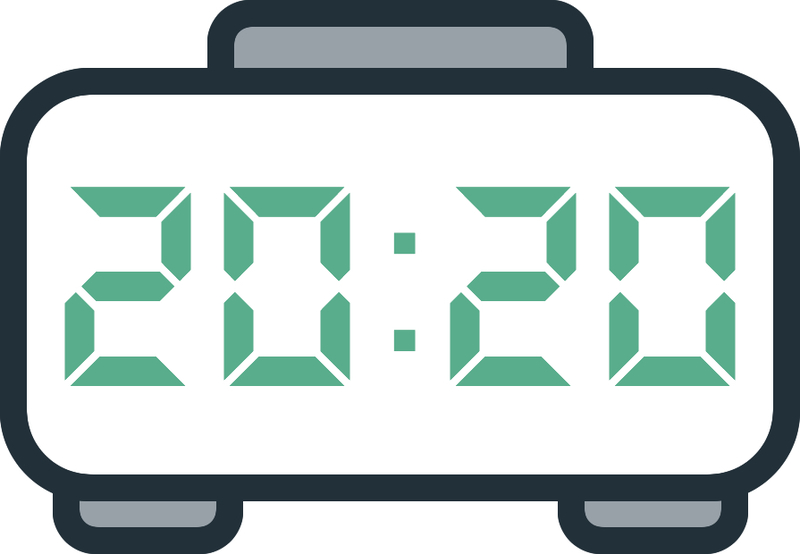 If you often see the mirror hour 20:20 then this is because you have made progress along this path and have managed to improve your connection with your angel or your spiritual guide. They have therefore sent you this sign as a thank you for getting closer to them. However your guardian angel may also use the double hour 20:20 as a warning! You may encounter a period of highs and lows. This could be to do with love, work, or money. Make the effort to determine which area of your life is being affected. The message could refer to an unstable situation which is temporary but significant enough that your protector has used this mirror hour to prepare you. 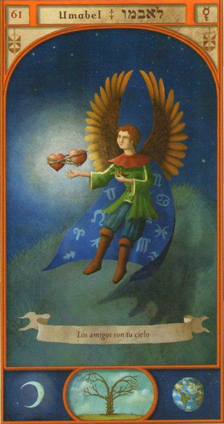 The guardian angel corresponding with 20:20 is Umabel whose period of influence is between 20:00 and 20:20. He is the symbol of independence! As you may well notice, he has a direct influence upon 20:20 which shows the special connection that you have with this angel. He helps you in the realm of the esoteric and in the divinatory arts in general. Under his guidance you will be given support in the study and mastery of astrology, numerology, and use of the pendulum. He helps you become a sociable person who is open to others and who has need of their free spirit! What does 20:20 mean in Numerology? 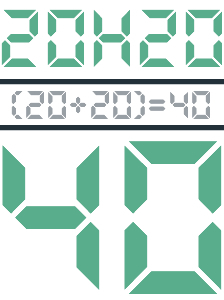 The total value of the mirror hour 20:20 is 40. This shows that you are a person with a practical mind. You have the ability to concentrate on your goals which allows you to act very efficiently, but consider taking some time over them. This is very important! This number also shows that you may sometimes find it difficult to control your emotions. This can get in the way of your social fulfillment. Learn to control yourself in all situations or else risk suffering for no reason. The twin hour 20:20 and its value of 40 can symbolize an obstacle or a limitation. There is also the same idea of instability that we saw when studying the angels. This number is about challenges or temporary difficulties that you may encounter. Do your best to ride them out. If you stay determined and keep doing things in your own special way you will overcome them! This sign also encourages you to be honest in your life. Do not lie to yourself or else risk facing setbacks in your romantic, professional, or financial lives. You should not lead a life of lies, as the truth will always come to light! 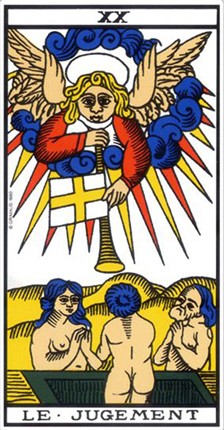 The Tarot card corresponding to 20:20 is Judgment! It indicates a change and a new era and is accompanied by a kind of renewal in your life. It symbolizes freedom of the body or the mind! It represents a kind of elevation within the spiritual world. The Judgment card says that there will definitely be change coming to you in your life in the near future. This Arcanum is about rebirth or evolution! This could refer to your ideas, or your way of interacting with others. If you are waiting for positive changes in your emotional life, they are coming! If Judgment is in a bad position it indicates that you will face setbacks. Here there is a sense of things getting in the way! It brings to light factors which are getting in the way of your development. Don’t lose heart and keep going. The storm will pass! On a romantic level, Judgment heralds an encounter, or a fulfilling relationship. Strap in! There are going to be changes in your love life and they may go by quickly! On the professional level you should soon reach the objectives that you’ve set for yourself, as long as you can keep your independence that is. You find it difficult to deal with the chain of command, isn’t that right? In money matters, a chance opportunity will present itself to you. If you are having difficulties managing your finances, they will be resolved quickly. An inheritance or a gambling win is foreseeable. Any comment on the 20:20 mirror hour? Thank you again! This is my second time on the 20:20 mirror hour. Blessings and thank u again!! Well it seems i have to really do something about this messages! Wow, 3rd time 20:20!! For some time now I have been seeing the mirror hour 19:19, 20:20, 15:15,11:11,03:03, 10:01 .. Thanks to my angel guide.. But I want to know deep and how to really connect to my angels. I am being warned or pushed hard to something? I have to meditate… Right? hey sara u saw 20:20 3 times…but i saw different different reflected mirror hours everday …..what do u think on this??? Me too!! Every single day! I found out that when in some difficulties, this mirror hours appear then i got the message and its amazing cuz they replay to me!! Its my 4th 20:20mirror hour! Then wondering why? Why me? And this Judgement card and angel message apeared!! Just amazing! I think is time.. I am not getting any younger! I want someone to love and be loved, i want real love! Pls universe. I deserve it!! !